"We concentrated our meagre resources on the largest boat, the JAMES CAIRD, so named by SHACKLETON." The voyage of the 'James Caird' was an epic boat journey from Elephant Island (Antarctica) to South Georgia in the southern Atlantic Ocean, a total distance of approximately 830 nautical miles (1,500 km; 920 mi). Undertaken by Sir Ernest Shackleton and five companions, their objective was to obtain rescue for the main body of the Imperial Trans-Antarctic Expedition (1914–17), marooned on Elephant Island after the loss of their ship Endurance. History has come to know the voyage of the James Caird as one of the greatest small-boat journeys of all time. In October 1915 the Endurance had been crushed and sunk by pack ice in the Weddell Sea, leaving Shackleton and 27 men stranded on the frozen surface of the ocean, thousands of miles from civilization. The three ships lifeboats where mounted on sleds and dragged toward the Antarctic Peninsula (Paulet Island) in the hope of finding a cache of food supplies abandoned by the Swedish Antarctic Expedition, 1902. Failing to make the mileage, the long haul was abandoned. During the months that followed the party drifted northward towards the open sea until 9th April 1916, when the ice floe on which they were camped broke up under the swell. Shackleton and his men made their way across the broken pack ice towards the remote and inaccessible Elephant Island, where Shackleton quickly decided that the most effective means of obtaining relief for his beleaguered party would be to sail the largest of the lifeboats to South Georgia. Of the three lifeboats, the James Caird was deemed the most seaworthy. It was named by Shackleton after Sir James Caird, a Dundee jute manufacturer and philanthropist whose sponsorship had helped finance the expedition. Petty Officer Tom Crean R.N. When Sir Ernest set off to find rescue he did so with one purpose in mind, to obtain relief as quickly as possible for 22 men left behind with no prospect of rescue from the outside world. On 24th April 1916, Shackleton set sail in the James Caird bound toward South Georgia, hoping to find help at the whaling stations of Stromness Bay on the island’s eastern side. Fifteen days after setting off, in the navigational equivalent of finding a needle in a haystack, they sighted South Georgia’s towering cliffs, negotiated their way to King Haakon Bay and landed at Cave Cove on the wetsern side of bleak island. Their landing was a stroke of luck, prior to finding a suitable cove, they navigated around rocks awash, hove-to during hurricane force winds, and tacked away from overhanging sea cliffs. After four days recovering from their ordeal, they sailed the James Caird for the final time to the northern shore of King Haakon Bay where they spotted a sheltered bluff - later named Peggotty Bluff in honour of their David Copperfield inspired shelter. Anxious about putting to sea again because of a shortage of food and a damaged boat, Shackleton, Worsley and Crean made a 33-hour dash across the island via a 3,000ft mountain range that was criss-crossed with treacherous glaciers. Upon arrival at Stromness, Shackleton duly raised the alarm, and after four months, and four separate rescue attempts, he rescued all his men on 30th August 1916. On 20th December 1916, Shackleton sailed aboard the Aurora from New Zealand back to the Ross Sea, Antarctica, to rescue the other half of his expedition: three men died during phase of the expedition. Shackleton brought to a close the Imperial Trans-Antarctic Expedition on 10th January 1917 before returning to England to join the wra effort on the Russian Expeditionary Front. 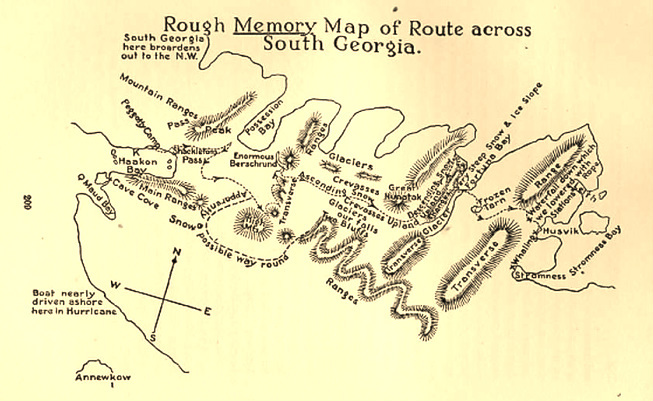 Rough memory map of route across South Georgia - 'South' written by E.H. Shackleton, 1919. After the epic boat journey the James Caird was hoisted onboard the steam powered whale catcher Samson, which had come round the north of the island to rescue Vincent, McNish and McCarthy. At Peggotty Camp the James Caird was found overturned and being used as a hut; the raised gunwales were burnt to generate warmth for the three debilitated sailors. The Norwegians who understood the historical importance of the boat insisted on the Caird being sent back to England. On arrival at Leith Harbour in Stromness Bay, the whalers mustered on the beach and, according to Worsley's account "they would not let us put a hand on her". Every man claimed the honour of lifting her on to their shoulders, carrying her immense weight of 1000 kilos up the wharf. Captain Thom of the Southern Sky, the ship that in May 1916 first tried to save the party marooned on Elephant Island, sent the James Caird back to Liverpool aboard the S.S. Woodville as deck cargo, arriving on 5th December 1919 along with a cargo of whale oil for the Lever Brothers. The boat was stored temporarily at Grayson's Shipyard, Birkenhead, and after an appeal to have her saved from the breakers yard, the boat was brought back to London as the largest relic of the Endurance. The James Caird went on static display at the Royal Albert Hall, the rooftop gardens at Selfridges on Oxford Street, and the Middlesex Hospital where Shackleton delivered one of many charitable public talks. 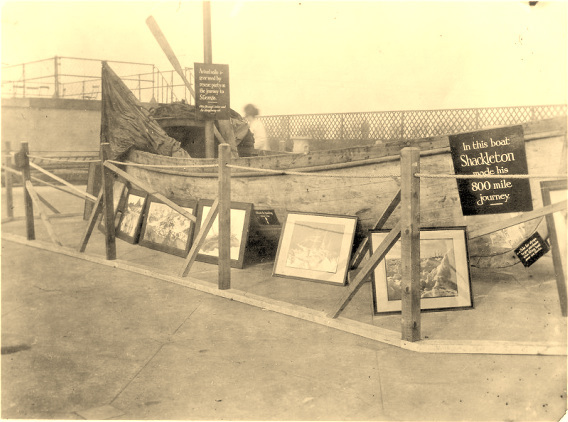 After various exhibitions, the boat was eventually gifted by John Quiller Rowett after Shackleton's untimely death in 1922. The little lifeboat is now preserved at Dulwich College, London. There are no photographs of the James Caird under full sail, only artist impressions of what the sailing rig ought to have looked based on descriptions by Worsley and Shackleton in their individual accounts. Close examination of the James Caird at Dulwich College, and Frank Hurley’s iconic photographs, reveal that a number of fittings on the original restored boat are missing or incorrectly reproduced. All known features are reproduced in the new J. Caird replica including fittings not installed on the original lifeboat during her restoration in 1968. By close scrutiny of historical records and photographic archives, the J. Caird (its proper name as stencilled by George Marston) is the most accurate seaworthy representation of Shackleton's lifeboat anywhere in the world. The mizzen mast and mizzen sail fitted to the original James Caird were removed from the Stancomb-Wills and cut down to size. In the iconic photographs of the James Caird departing Elephant Island, it's possible to see the Stancomb-Wills and the Dudley Docker without masts as both vessels had donated many of their fittings to equip the James Caird. The current suit of sails fitted to the James Caird are not authentic to the 1916 period, they are replicas produced around the late 1960s. These sails have been cut flat and wouldn't perform well at sea. Sail canvas has to be lofted leaving enough curvature in the material so that it can take shape over time; this process gives sails the ‘bulgy’ appearance we are so familiar with. This method of sailmaking, better known as broadseaming, has now been replaced by computerized sail design. The bolt rope stitched around the periphery of the sails maintains the shape and prevents the edge from fraying or stretching. Fortunately, the original mizzen sail still survives and can be seen at Dulwich College. With sail making experience gathered over a lifetime at sea, traditional sailmaker Philip Rose-Taylor has determined that the material used for the original sails was a natural fibre, probably Royal Navy No.7 duck canvas made by Francis Webster’s of Arbroath. Only the mainsail and jib sail can be reefed, their reef points aligned with the clews of the sails so that the sheet leads don’t require re-positioning. The main and mizzen sheet lines run through Admiralty pattern blocks, the largest block onboard being a double sheave block employed in the mizzen sheet in order to gain purchase when the mizzen boom has to be trimmed across the stern of the boat. All the running rigging was most likely operated by Chatham Hemp or Manila rope purchased in London. When sails clutch the wind, the yards exert pressure on the masts bending them from side to side and imparting huge amounts of torque along the central axis of the mast. Steel wire ropes (SWR) known as shrouds secure the masts to the hull and prevent the masts from bending excessively – the shrouds aboard the James Caird were 'Liverpool spliced' by hand, parcelled and served over with tarred Marline and covered in Stockholm tar. The shrouds which hold both mast in position were secured to the inside of the lower gunwales by four brass screws - not ideal due to the amount of tension required to secure the masts in place. In modern vessels, it is common to use chainplates or securing lanyards to thwart risers. Originally commissioned by Capt. Frank A. Worsley (skipper of the Endurance) to his specification. Boat ordered in July 1914 six months after the introduction of the new Safety of Life At Sea Convention (SOLAS) . Constructed to the new standards by W & J Leslie, boat builders of 36 Coldharbour Lane, Poplar, near the northern entrance to the West India Docks, London, UK. Walter West Leslie (master shipwright) and John Ashcroft Leslie were recipients of the International Fisheries Exhibition Silver Medal, presented by Queen Victoria in 1883. Double-ended whaler design deliberately ordered as a lightweight variant of the standard 'Board of Trade' lifeboat: "more lightly built than is required by the Board of Trade. This made her springy and buoyant"
Her hull was carvel planked creating a flush outer shell as opposed to clinker built where the planks overlap. The James Caird was planked with Baltic Pine, keel and timbers from American Elm, stem and stern post made from English Oak. Her gunwales were raised approx 15 inches by 'Chippy' McNish during the slow drift of the Endurance. The boat was not ‘made more seaworthy’ at Elephant Island as is commonly described in history books, the process of conversion took several months. Shackleton and Worsley knew they would have to undertake a boat journey after the sinking of the Endurance. 'Chippy' McNish began work immediately on the largest and strongest boat by raising the gunwales at Patience Camp. Both the James Caird and the Dudley Docker had their topsides raised using timber removed from the Endurance motorboat. The Dudley Docker had an additional 8-10 inches added to her topstrake (photographs of the Dudley Docker are often mistaken for the James Caird). To make room for men and stores, the Muntz metal tanks (reserve buoyancy tanks) fitted in her as a lifeboat were removed, along with a number of thwarts to create space. Tim McCarthy, Alf Cheetham, Lionel Greetsreet, and Wiliam Bakewell constructed a deck over the James Caird by creating a lattice structure from four Nansen sled runners, each runner was most likely produced from Ash and protected with Pine Tar during previous manufacture. Old Venesta packing case lids were screwed and nailed over the runners to produce a semi-rigid deck before being covered in stretched canvas defrosted foot-by-foot over a blubber stove. Shackleton described the covering of the James Caird as “a strong likeness to stage scenery”. The bow section of the boat had the strongest and most watertight portion of decking created by a ‘whaleback’ which extended from the stem post to the mainmast. The stern end also had a small 'whaleback' extending rearward from the mizzen mast towards the stern post. The main mast from the Dudley Docker was bolted to the keelson as a reenforcement (keel-hog) to prevent 'hogging' at sea. Expedition artist George Marston caulked the new topside seams with lamp-wick and frayed woollen socks, ‘paid’ with oil paint, flour and seal blood to finish. Damaged hull planking caused by man-hauling the boat over ice ridges were re-protected using copper 'tingle', Venesta plywood patches, and fixed boat skids. Due to the lack of a deep keel, approx. 1016 kgs (23 cwt) of ballast in the form of shingle and sand were secured in canvas bags made from old blankets. Large boulders were positioned around the ballast bags in the lowest part of the hull to reduce the center of gravity and provide maximum stability and righting moment. Safe working load of James Caird according to Worsley's calculations: 2 1/3 tons (2370kg). Freeboard during the epic journey: 2ft 2in (660 mm) ie. height above water. The James Caird is in fact 23ft 6in (23' 6") long overall (LOA). Shackleton and Worsley often refer to the overall length as 22ft 6in however, this is the internal measurement of the boat prior to the gunwales being raised by approx. 15 inches. The James Caird was equipped with 4 oars – approximately 14 ft long (2½ times the boat beam) hand made from a single length of Spruce. The rowing positions of the James Caird are one of the great unknowns of Shackleton's boat. At Peggotty Camp, it is recorded that Shackleton ordered the topsides of the Caird to be removed as a source of wood and burnt. Sadly, this also means that all evidence of the rowlock positions were lost; only one rowing position survives (port, forward position). Neither Shackleton nor Worsley accurately record the rowing technique or the positions, therefore from a practical seaman's point of view, four functional rowlocks would have been necessary for the voyage. Rowlocks are essential when planning surf landings on rocky shores, specially the dumping surf shorelines of South Georgia. Artist impression of James Caird under sail - 'Shackleton's Argonauts' by Frank Hurley. On the 25 September 2001, the world famous auctioneer Christies, sold seven little known photographs of the James `Caird taken at Grayson's Shipyard, Birkenhead. They were the first photographs of the boat taken after the legendary boat journey from Elephant Island to South Georgia, and show her uniquely, in her condition prior to being exhibited in London, and with relics of the boat journey on display. Along with clothes and sleeping bags, one can see Primus stoves, Hurley's brass baling pump made from the flinders bar from the ship's binnacle compass, a case of Streimers Polar Nutfood and one of the fresh water barrels. However, the boat in the background is not the James Caird; it is clearly discernible as a clinker built boat, the James Caird was carvel built. Sadly, according to a little known account, the original rudder which was knocked off at Cave Cove and miraculously recovered, was replaced for unknown reasons when the James Caird was restored by Cory's Barge Works in Greenwich, 1968. "If you wish to learn a bit more about Sir Ernest Shackleton and the James Caird, obtain technical specifications, detailled equipment lists, and a true insight into how 6 brave men sailed a totally inadequate boat across the Southern Ocean, please watch this space for my book to be published in 2019".